(Bloomberg Opinion) -- Haruhiko Kuroda is miles from where he wants to be. About 200 miles. That's the distance from Tokyo to Nagoya, where the Bank of Japan governor gave a very upbeat speech last year. Some interpreted those remarks as laying the groundwork for a shift from the ultra-accommodation that's been the central bank's trademark. In terms of monetary policy, Nagoya might as well be on another continent. That's how much the outlook for interest rates, globally, has shifted. Talk of normalization, however gradual, is now passe. If anything, the question among observers has become when and how the BOJ will ease further. The central bank doesn't have stacks of ammunition up its sleeve and officials are conscious of the squeeze negative rates put on some lenders. Playing for time appears to be the approach the BOJ is adopting. 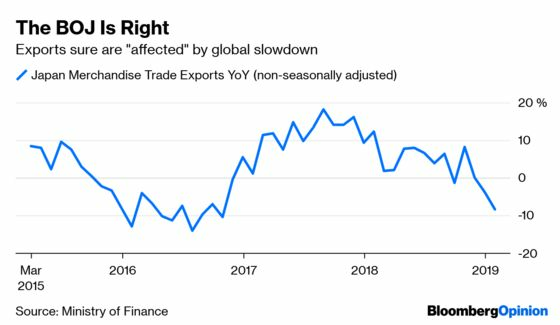 Time to see how severe this global soft patch is, whether China can bounce, and whether Washington and Beijing reach a detente on trade. The central bank's board kept policy unchanged at its meeting Friday; no change was anticipated at this gathering. The bank's next big forecasting report will be released at the April conclave. Kuroda & Co. are in a dicey holding pattern. The data aren’t static. The ball is moving away from them. In the time game, the government bought the BOJ an extra innings. Finance Minister Taro Aso said Friday it isn’t the end of the world that the bank hasn't met its 2 percent inflation target. Obsessing about it risks a mistake. On the face of it, this reduces pressure on Kuroda to take further steps, aka additional stimulus, aimed at reaching that goal. It must be said that while the BOJ has failed to get price increases to the magic 2 percent, the volley unleashed by Kuroda since 2013 hasn't been a complete failure either. There's a problem of low inflation now in Japan, not deflation. The target seemed within grasp a few years ago, before momentum stalled. Inflation targets were in vogue for a long time, but were grounded in the idea that too-high inflation was the biggest challenge central banks faced – not the opposite condition that prevails today. And unlike other major economies, Japan got the 2 percent mark after a long period below that level. Is it harder to achieve an inflation goal if you start beneath it, rather than above it? There's a lot wrapped up in the dilemma Japan now finds itself in. Years of policy innovation, consumer psychology, whither targets, peak China and the future of trade. Not to mention the specter of a consumption-tax increase planned for October; the last hike was blamed for a recession. If only it were just about interest rates.